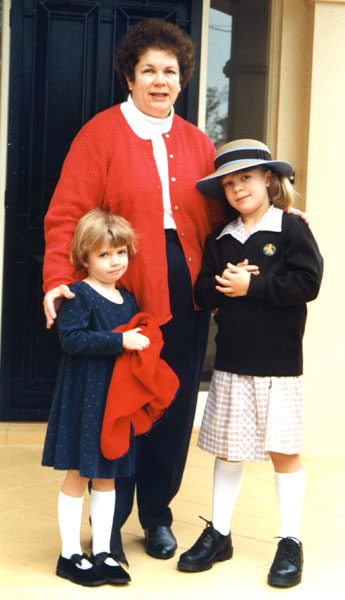 December 2-7, 2001 - Christmas events: Monday night was the Wilderness Junior School Christmas concert. The Kindies (Lucy's class), Reception, Year 1, and Year 2 (Clara's class) girls all performed, and all the classes did a wonderful job. There was a delightful variety of numbers--some, such as "Silent Night" where the girls sang like a choir of angels and others, like "Christmas Boogie" where they included dancing and had the audience in stitches. Lucy's class performed "Rock Cots" - which is a song about starfish, and where they sleep - in rock cots ("cot" in Australian means crib). Since Clara's class has been studying Japan and Japanese culture this term, they did a couple of songs while dressed up in kimonos, geta (traditional wooden shoes that they had made in their "technology class"), and their hair done up in buns with chopsticks. Wednesday night Tim flew to Melbourne to attend a meeting on Thursday. He also discovered a Starbucks a few blocks from his hotel, but unfortunately didn't have time to stop in during business hours this trip. Thursday morning was the last assembly for the junior school girls at Wilderness. Sandy attended, and saw Clara graduate from Year 2. (Boy was that a short year!). Unfortunately both Tim & Sandy missed the previous assembly a couple weeks ago, where Clara had a speaking part, which apparently went smashingly, according to her teacher. Tim managed to make it home from Melbourne in time for Sandy to attend her first Quilt Guild meeting (the Quilters Guild of South Australia, which meets just a couple of miles from our house). There was quite a crowd there, with many people showing off their projects, including ones still in work. Sandy is already planning to take her quilted Christmas tree skirt to the Christmas meeting next year--and she is looking forward to attending quilt "camp" in July. Friday, we were invited for drinks by our next door neighbors Hermann and Marion, along with neighbors Tony and Margaret from across the street. Hermann and Marion came from Germany to Australia 43 years ago, but stepping into their home was, for Sandy, just like visiting friends in Germany for Abendbrot. We had a lovely time, exchanging stories of our respective countries. Tony & Margaret had spent 5 sunny days in Seattle as part of a vacation about five years ago, but were unable to get any of their other American friends (from New York, etc.) to believe that there were ever five sunny days in a row in Seattle! When we returned home, we started putting the ornaments on the tree. Clara and Lucy delighted in unwrapping each ornament, especially the ones they had made themselves in years past. Even with the flowers blooming and the sun shining, it is starting to look like Christmas! December 8, 2001 - A Few Pictures: We finally got some film developed, and Tim scanned a few pictures in. They are located here. Notice on the house pictures (here and here) the brush fence beside the driveway. These are very common here, and are made from brush harvested on Kangaroo Island. 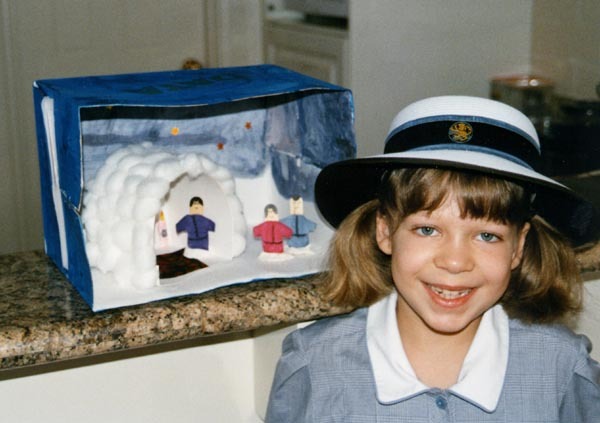 On the first day of school picture, notice that Clara is wearing the old style (brown checked) Wilderness uniform, while in the Kamakura diorama picture she is wearing the new (blue plaid) uniform. 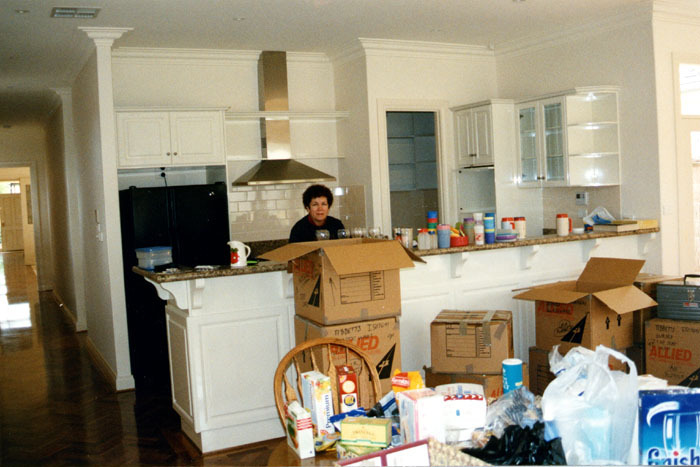 In the picture of Sandy unpacking in the kitchen, you can see the long hall to the left that runs the entire length of the house. 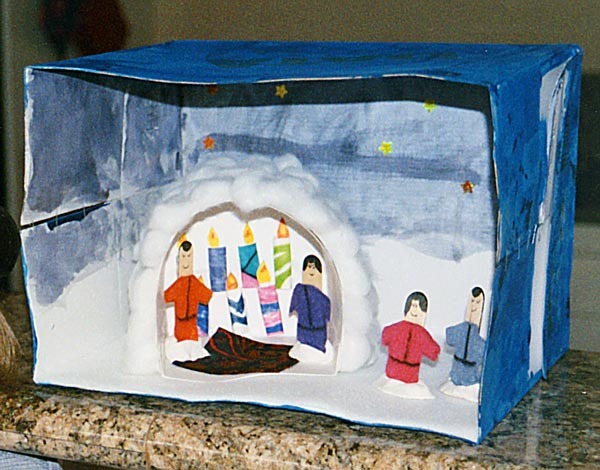 December 9, 2001 - More decorations: We did add one more picture to the picture page, which provides a better view inside Clara's diorama. Otherwise, Sandy has been baking Christmas cookies (Butter Spritz and Cadbury bar cookies from Laurie's recipe) for Clara's and Lucy's teachers. Tim finally got the lights on Clara's and Lucy's little 2-foot-tall Christmas trees, and Sandy wrapped a couple of tall moving boxes with Christmas paper - so now we have "window decorations"! Since we didn't bring our red Christmas candles and red outdoor lights with us, it hasn't been apparent from outside that we are celebrating Christmas - but now we have put one of the girls' trees in each of the front windows to the house. The only trouble is that it doesn't get dark here this time of year until well after 9pm - so the lights still don't show up well until long after Clara and Lucy have gone to bed! We wish that we had a way to record the sounds from our backyard (or actually, from inside the house), so that we could share the bird songs. We've never heard this much music from birds before. We still don't know the various birds well enough to tell who is making what sound - but there are magpies, doves, parrots, kookaburras, etc. in the area - and they start singing before dawn, and keep on going until sundown. 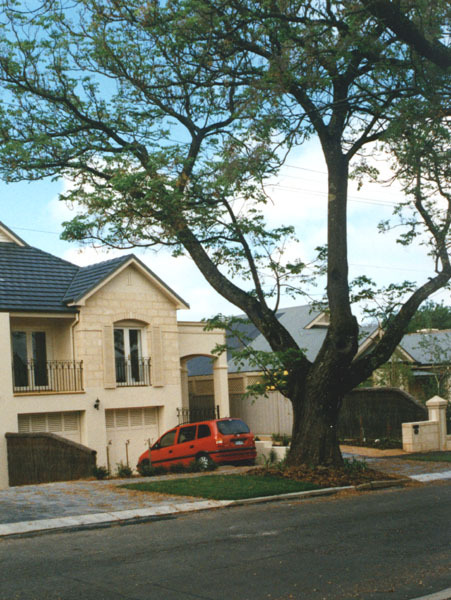 December 10, 2001 - Life as usual: We continue to settle in. This past week the builder and landlord arranged to have a few more items repaired around the house, but there are still a few more to go. We had more of the little household annoyances taken care off - in particular, the smoke detectors have all been wired into the household power now, so hopefully they won't complain about dying batteries in the middles of the night any more. We also had a bad dimmer switch replaced, twice, and now seems to be working. We are also waiting on some minor plumbing repairs, and some minor trim work - unfortunately, we will be having some major work done on the par sometime in the fall (approx April) - to tackle some lifting and splitting floor boards - we don't know what that is going to involve yet. Other good news is that we've finally rented our house in Seattle - after all the Boeing layoffs and the general economic downturn, we'd reconciled ourselves to having the house empty. However, the "small world" factor has come into play again - the family renting it is an Australian family from Adelaide - the husband is working on the same project Tim is, but for BAE SYSTEMS instead. In fact, Tim worked with him before in the days prior to the signing of the Wedgetail contract. They have four young children, so they'll fit into the neighborhood well. 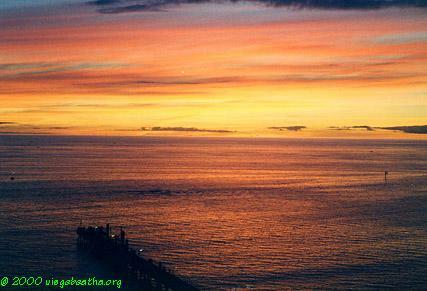 December 11-16, 2001 - Summer Break Starts: This has been a busy week, since the Boeing team is visiting, and Tim has been leaving the house early and returning late, meaning that Sandy has had to make all the trips taking the girls to and from school. Lucy's last (half) day was Monday, and Clara's last (half) day was Thursday. Tuesday was "Red and Green Day" at school where all the girls wore red and green clothes and red and green ribbons in their hair and had a picnic lunch outside of all red and green foods. We saw slices of buttered bread sprinkled with red and green sugar on the buffet tables on the lawn and heard a mom asking her daughter if she wanted any fairy bread---so we learned another bit of Aussie food terminology. Now that the girls are out of school, we're not sure whether we'll be less or more busy--- - their social calendars were running pretty full during the school year - Clara had five field trips (excursions in Australian) over the course of 8 weeks of school, plus assemblies every other week, various concerts / shows, etc. We're hoping for a relatively peaceful summer break, with just some day trips for the whole family to explore the area. In addition, on Thursday evening we had the Boeing and Commonwealth of Australia team over for pizza, wine and beer. (For more information on the Wedgetail program Tim is supporting, look here, here or here.) Of special excitement for the girls was their first meeting with the identically-aged daughters of one of the other Boeing families who have just arrived down under to work at BAE SYSTEMS. This family has just rented a house on the beach, so we expect our girls will be spending a lot of time together running on the sand and swimming this summer. Unfortunately, they don't have much of their household furnishings yet - most of them are still on a cargo ship, due into Adelaide this coming week - given the holiday season and the fact that Adelaide pretty much shuts down around Christmas, there is little hope of them getting their stuff through customs before Christmas - so we feel very lucky to have gotten our household goods from the States and to be reasonably well settled. Friday, Clara went to her fourth birthday party, while Lucy and Sandy went to a park. Lucy also had to go to the doctor again. She was diagnosed on Monday with tonsillitis, and given an antibiotic for that. At the same time, her doctor noticed that her ears were full of wax, so he also prescribed a wax softener to be used all week, followed by a return trip for ear cleaning on Friday. She did a fabulous job of cooperating, with the doctor remarking he had never had a more cooperative little girl. Unfortunately, once the wax was out, he noted that both ears were infected, so she is now on another antibiotic for that. On the good side, Lucy was quite pleased with the results, since her ears felt much better to her after the wax was out. Friday, Tim took the written part of his Australian driving test and passed; now he has 30 days to take the road test. Sandy spent some more time this weekend studying the Australian road rules book, getting ready to take her test tomorrow. Saturday morning, we went to the Adelaide Central Market for the first time. We had breakfast at one of the many cafes, and cruised the fresh produce vendors (much like the Pike Place Market in Seattle, with vendors calling out their deals - but no flying fish), as well as the various small shops in the associated arcade (arcades are common across Adelaide, and are sort of mini-shopping malls built into an existing building.) At home, the girls wrote a play and put on multiple performances for Sandy - or Tim - or Tim and Sandy - each performance adding new features to the drama. Tim & Clara and Lucy also managed to get out to play at a park and to do a little Christmas shopping. So, we are getting prepared for Christmas - and none too soon, since Christmas comes a day early Down Under! December 17-22, 2001 - Countdown to Christmas: On Monday, Sandy took the written Australian driving test and passed, so her 30 day clock is ticking now as well. She also arranged "refresher" lessons for both Tim and Sandy with an Australian driving instructor for Christmas Eve, to be followed by the actual tests on January 2. In the afternoon, Clara entertained one of her new school friends, Katerina, and they had fun playing hopscotch in our courtyard and Polly Pockets, etc. Now they are planning a sleep over later in the school vacation, and Katerina wants to learn to play BINGO. The girls have had a last bit of school fling prior to the full onset of summer - Wilderness sponsors a "Spin Off" week immediately prior to Christmas, where the kids go and partake in a variety of activities from crafts, to arts, to sports activities. Sandy was thinking of letting the girls go for one day, but Clara and Lucy each pleaded, "Couldn't we go for two days, Mom?" So they went on Tuesday and Thursday. Clara chose tennis, swimming, art, and Christmas crafts. Lucy did activities for the younger kids such as making angels, pine cone ornaments, playing in the sprinkler, decorating ice cream cones, singing Christmas carols, and so on. They were both pretty well knackered by the end of each day. Clara had such fun with tennis, and of course now wants to take lessons and play regularly. Sandy used Tuesday to go into the city and do some shopping and exploring. Thursday she went to the supermarket and was home in the afternoon for visits from the landlord and the parquetry floor fellow. Thursday, Tim got his main Christmas present early - his new VAF speakers were finished, so he stopped by the shop to pick them up, then brought them home, set them up, and settled in to to listen. However, he had to quit early, in order to walk to the Christmas party that his group at BAE SYSTEMS was having - it was being held at a local "Mongolian" style restaurant within walking distance of our house. For those who haven't eaten at this style of restaurant, it is named after a cooking style of the early Mongols, who reputedly would build a fire, then place their shield on top of it, and essentially stir fry whatever food they had - meat, vegetables, spices. The restaurant versions usually have a single large grill, with a one or two chefs in attendance. There is a "buffet" of raw ingredients - meat, seafood, vegetables, and the customers fill a bowl (or two) with whatever they want, then add their own sauce from a selection of sauce components (e.g., soy sauce, sesame oil, sherry, garlic, etc.) and hand the bowls to the chef, who then cooks it on the grill, and hands it back. This particular restaurant has a wood-fired grill - the first time we ate there, we had to wait a while until they got the grill up to temperature, since we arrived right after opening; in Seattle, the restaurant we went to (Chang's Mongolian Grill) had a gas fired grill. It was also interesting to us that the chefs at this restaurant used VERY long chopsticks to control the cooking; in Seattle, they had large spatulas. No doubt the Adelaide version is more "authentic" and closer to the original approach. See this article for more than you probably want to know about Mongolian cooking (not just grilling). Friday was Tim's last day at work for two weeks, since BAE SYSTEMS shuts down even longer than Boeing at Christmas. Traditionally, all work stops at noon on the last Friday before Christmas, and "Closing Day" activities, involving on-site barbies, open bars, and bands - all provided by the company - take over for the afternoon and on into the evening. When Tim arrived Friday am, one of groups had jumped the gun, and had the barbies working away cooking breakfast for the troops, and the beer was already being passed around - at 8 am! We watched a fun Australian movie on DVD this week starring Sam Neill - called The Dish - it has been released in the States as well. It is about the largest radio telescope in the southern hemisphere, located in the middle of an Australian sheep paddock, which turned out to be one of the critical links in receiving the TV pictures from the first moon landing in 1969. The film revolves around the crew of the dish - 4 Aussies and an American from NASA, and how they adapt to each other and the various crises that threaten the completion of the downlink. The story apparently takes some liberties with the truth (see here for comments from one of those involved in 1969), but was very enjoyable nonetheless. Saturday morning, Tim and the girls went for a bike ride along another section of the Torrens, the river that flows through Adelaide. At home, Sandy was busy baking Cranberry Swirl Coffee cakes (from a recipe by Tim's Mom) to take to the breakfast our relocation agents are having in the park tomorrow morning. December 23-26, 2001 - Christmas! : Sunday morning, we all went to a park just a half mile away for "Breakfast in the Park" with our relocation agents Lyn and Marie and their families, and some of the other families they have relocated over the past year. We all had a great time meeting and talking to people, and the girls were off exploring immediately. Sunday night we headed north to look for Christmas lights. We drove past Tim's workplace, so everyone could see where he went each day, then out Black Top Road to One Tree Hill, where we were too early for the big light display to show up well. So, we continued on to Lobethal, stopping a couple times to check the map, since we don't yet know all the little roads in the hills. We knew we were getting close when we ran into all the traffic. We drove through town and some of the streets, then looked for the lowest-traffic way out of town in the direction of Adelaide, which turned out to be Gorge Road - traveling this route, filled with 25 km/h hairpins at night was quite exciting! The high point of the trip for Tim and Sandy was seeing several groups of wild kangaroos feeding in fields along the way - as in the states, where deer are often seen grazing in the evening with cattle and horses, here the kangaroos were sharing fields (or paddocks, as the Aussies tend to say) with cattle and horses. These were the first kangaroos outside of a zoo that Tim and Sandy and Lucy had ever seen (Clara had seen a wild kangaroo shortly after we arrived). Monday was filled with final holiday preparations - Sandy made potato salad, a broccoli and cherry tomato salad, and a big batch of iced tea to take to our neighbors on Christmas day. Both Sandy and Tim had their "refresher" driving lessons, and some last minute wrapping was accomplished. Tuesday was Christmas!! The girls slept in reasonably well, until nearly 8. As they came down their stairs, they immediately noticed that the stockings were missing (we had hung them on the stair rail, since we don't have a fireplace or mantel for them). They had forgotten to put out a snack and drink for Santa, but Tim and Sandy remembered - Clara was quite relieved when she came into the kitchen and noticed the remnants of the snack - she said she'd been worrying about that all night! We had breakfast, then settled down to the serious business of opening stockings. Tim got a bottle of scotch in his stocking, and Clara was almost beside herself - since she knew that he was receiving a couple more she had helped wrap - she was equally concerned, for similar reasons, and barely able to NOT explain why, when Sandy received a CD in her stocking. After that, Sandy made a fancy table centerpiece of fresh holly and shiny red Christmas balls which just about filled our table - we then took it and the salads over to our neighbors across the street, Katrina, Shane and their children, William and Francesca, where we shared a delicious traditional New Zealand Christmas dinner (which is actually closer to an American Christmas or Thanksgiving dinner than an Australian Christmas dinner - ham, turkey, stuffing, cranberry sauce, salads, potatoes, peas, carrots, etc., following by a Christmas pudding). Friends of theirs from New Zealand who are currently living in Sydney drove over for the holidays, so we had 6 children, of which Clara was the oldest, running around having a great time. The girls enjoyed the new tradition of popping Christmas "crackers" and opening them to find a joke printed on a slip of paper and a little trinket. It was a wonderful introduction to Christmas down under! About 5, we were thinking we should leave to finish our unwrapping of presents, when Clara had a fall in the yard and hurt her foot. So, we got her home, and into a recliner, covered her foot with bags of frozen peas (our standard way of icing sprains, etc. 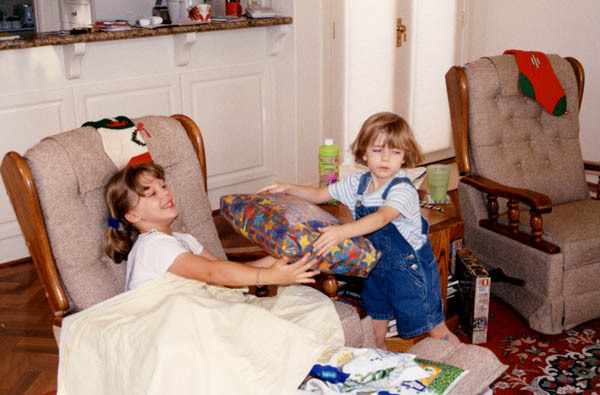 ), and began opening presents. After all the presents were open, we relaxed with the girls by watching part of Mary Poppins, which Clara got for Christmas from Sandy's parents. A long but fun day! Wednesday, we lounged around, recovering from Christmas. The weather continues to be reminiscent of Seattle in early or late summer - blue sky with a few clouds, temperatures in the 70s. We may yet try to make it up to the Flinders if the hot weather holds off. December 27-28, 2001 - Holiday Pictures! : We forgot to mention that Dec 26 is Boxing Day in Australia, England, Wales, parts of Canada, and in some other countries of the Commonwealth of Nations. Traditionally, on that day the employers would give presents, generally of money, to servants, tradespeople, and itinerants. These presents came to be known as Christmas boxes. In rural parts of England and Wales, it was traditional for small boys to capture a robin and take it in a box from house to house, asking for alms. So the "after Christmas" shopping frenzy doesn't start until Dec 27 - and then it is just as bad as in the States! However, instead of shopping, we spent our Thursday combining a few errands with practicing maneuvers for our driving tests next week. Friday Tim did some outside yard work with the girls in the morning, while Sandy caught up on some inside cleaning. Then we got some more pictures developed and scanned a few for the picture page. Note the frozen peas on Clara's foot and Lucy passing out the presents here. We also drew up a simple floor plan of the house, which is available here. We also forgot to mention that the Australians generally say "Happy Christmas" instead of "Merry Christmas." 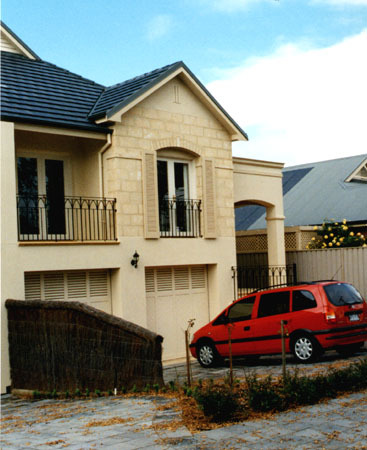 December 29-31, 2001 - Winding down for the year: Saturday we puttered around the house and ran a few errands; Sunday we decided to head off to explore the Fleurieu Peninsula south of Adelaide, including Victor Harbor and Cape Jervis. Victor Harbor is one of many small, tourist-oriented beach front towns along the coast, with good beaches, cafes, carnival rides, and good locations for whale and penguin watching. We ate lunch, walked on the beach, and marveled at the brilliant blue water, white foamy waves, and rocky cliffs. Then we continued on around the coast, through Deep Creek Conservation Park, one of many Conservation Parks on the peninsula. But Deep Creek itself - what a misnomer, at least the parts we saw - it was perhaps 5 feet wide and 1 foot deep - but there are supposed to be trout in parts of it, so Tim will likely be back. We continued on to Cape Jervis, which is the jumping-off point for Kangaroo Island; the main attractions are the ferry terminal and the lighthouse. The terrain varied considerably from place to place - one area would have fields of gum trees; another area would have huge pines. Occasionally there would be vast herds of sheep spread across wide fields, sometimes cattle - very infrequently we would see an irrigation system in action, pointing up the fact that South Australia is the driest state on the driest continent on earth. There was a lot of green growth still around, since the summer has been unusually mild and wet so far. Last stop before heading home was Normanville for another beach walk and some ice cream. Monday was the day to take down the tree and pack away all the Christmas decorations - and scan a few more pictures for the web site. They are on the Aussie pictures page. We plan to spend a quiet New Year's Eve at home; we'll see if some of our neighbors celebrate as much as they did on Boxing Day!